Full Version and Update Version, starting July 2018. We are now offering either 1 or 2-day courses throughout the week to cater for operatives wishing to achieve this new and legal qualification. If you have completed the 17th Edition 3rd Amendment you will qualify to attend a 1-day update course. Candidates who are new, or who presently hold an older version will be advised to attend our 2-day course. This course is presently being designed to give the candidates the best possible opportunity of success. This short electrical course is intended for all persons involved in the electrical industry including operatives new to the industry. 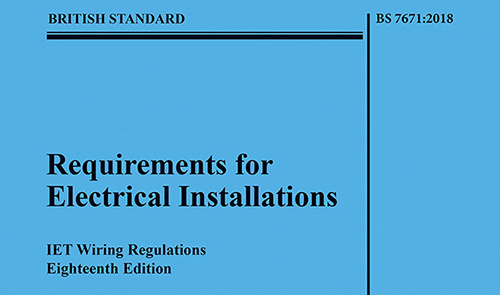 The course is theory based, providing the under pinning knowledge and understanding of all 8 parts of the latest version of the 18th Edition Wiring Regulation BS7671:2018. Candidates are expected to complete an open book multiple choice test on the final day. With a continuous high success rate achieved by our learners here at Training in Electrical, it is advisable to consider registering onto this short 2-day weekend or evening course well in advance of the release date. All candidates with the City and Guilds 2382-15 (3rd Amendment, Yellow Version of The 17th Edition course) wanting to gain the 18th Edition course 2382-18 will be able to choose this option. All Candidates wishing to complete this course will need to provide proof of Certification, via scan/photocopy of your City and Guilds certificate prior to Booking Confirmation. This update course will run as a 1 day update and the course will be constructed on the 18th Edition updates only. Candidates should already have the prior knowledge on the remainder of the 17th Edition book from their previous course. You will be completing the same full 2 hour exam as candidates sitting the “Full,” Course. Only suitable for candidates with confident knowledge of the 17th Edition 3rd Amendments and proof of Certification. or visit to reception to book your place on one of the 18th Courses.